This year’s Wakefield Show took place on 22nd April – about seven and a half months ago, so I must (once again) apologise for how long it has taken me to write and publish this report. As I noted at the start of the Southwest Show report, this is largely a reflection of how busy I’ve become in my general (non RISC OS) life. And echoing the Southwest Show report in another way, I also forgot to take my usual camera to the Wakefield Show. All of my photographs were therefore taken with my phone – which I really, really don’t like as a camera; it feels unnatural to me to hold up a phone to take a photograph. As such, I don’t have a huge number of pictures – and I tend to use them (even if they’re too naff to get away with using in the report itself) to help remind me of what was said and shown at the event. 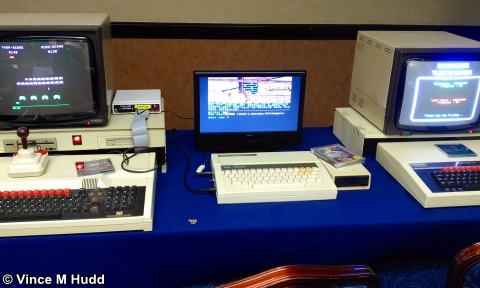 The show took place in its usual venue – the Cedar Court Hotel, Wakefield – and occupied a set of rooms; the Cypress Suite, which was largely host to RISC OS exhibitors and will henceforth be called the RISC OS Room, and adjoining it the Hawthorne and Oak Suites, largely hosting retro exhibitors, and so will be called the Retro Room. This report will follow a figure-8 path, working anti-clockwise around the Retro Room (stands 1 to 8 based on the floor plan shown above) and then clockwise around the RISC OS Room (stands 21 to 9). 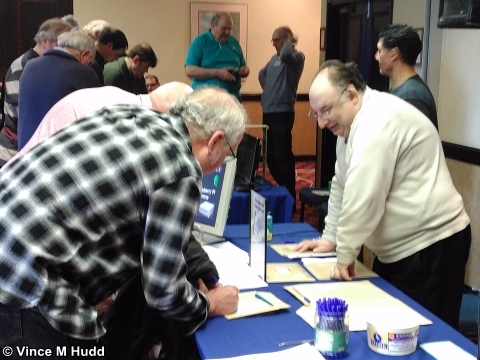 The group that organises the show each year is the Wakefield RISC OS Computer Club, and they were on the first stand encountered upon entering the show. Amongst other things they were selling punters on the benefits of membership – including a monthly newsletter delivered by email, access to an online discussion forum and a private section of their website. The group holds monthly meetings, usually with an interesting or topical guest speaker, and this can occasionally result in attendees seeing new products before they are released to the general public. Free entry into these meetings is another benefit of membership, whereas non-members have to pay a £3.00 entry fee. Also available from the WROCC stand were a CD containing all of the back issues of the newsletter, and their popular networking guides. Immediately next to the WROCC stand was the charity stand, where all manner of things old and new(ish) were available to buy in the name of raising money for a good cause; everything from books and magazines, cables and interface cards of various forms, software – and even a BBC Micro, which I should think could be had for a much better price than some of those available on eBay. WROCC’s efforts (with the help of anyone who has either purchased something from the charity stands, donated something to be sold, or just donated any money to the cause through them) have seen a running total of over £18,000 raised over the years – an impressive amount. As ever, the charity supported at the show is the Wakefield Hospice. Younger computer users today may not realise this, but there was a time before the internet; a time when there wasn’t a wealth of news and information available at the click of a button. We had to either watch the television or listen to the radio for broadcast news, typically the most up to date kind, or buy a newspaper or magazine for the news in printed form. Between those two extremes, it was possible to use one computer to ‘dial up’ a specific service, such as Prestel. Short for “Press Telephone”, Prestel was a service that allowed people to access information through their computers, over a telephone line – and the Retro Acorn stand featured an “Acorn Communicator” and a recreation of Prestel. 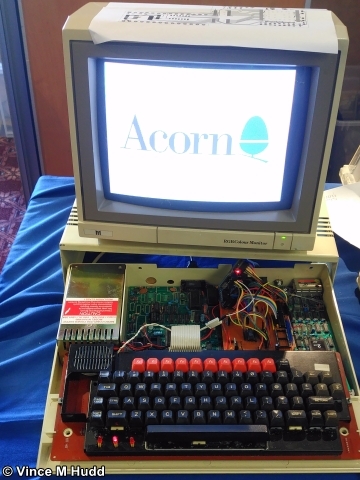 An Acorn Communicator at Wakefield 2017. That green thing to the right is what a telephone used to look like. No, really. Jason Nicholls and Dave Moore were representing Retro Software, demonstrating that new games were still being written for BBC computers, even today, with a selection of games available for visitors to try out for themselves. 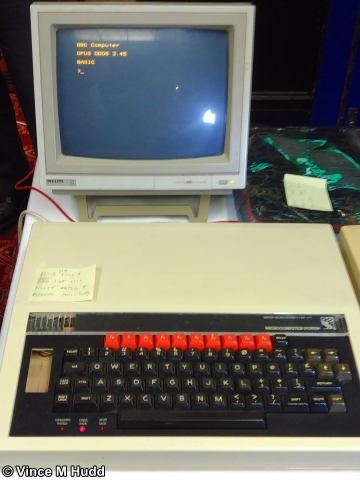 I’ve no idea who purchased that BBC Micro that was on the charity stand, but it’s fun to imagine it was someone who had played and enjoyed one of the games on the Retro Software stand(s) so much, that they decided they needed their own machine to play them on at home. 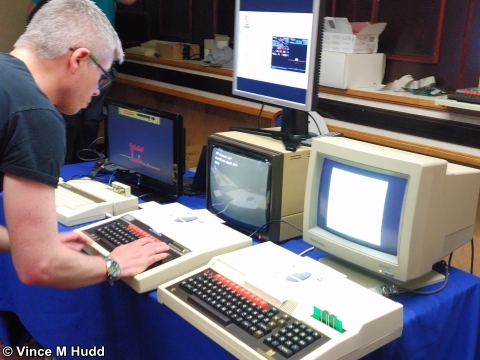 Anyway, that aside, the Retro Software guys were also promoting an event at the Centre for Computing History that, at the time of the Wakefield Show, was upcoming – the Acorn World exhibition that took place in May. 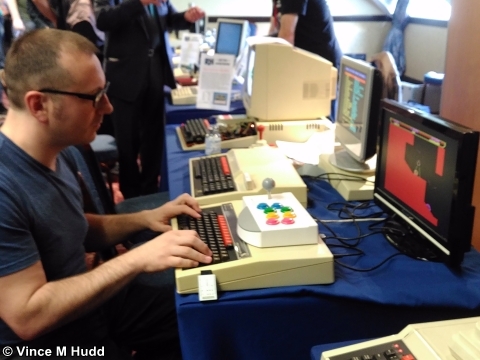 The Acorn and BBC Micro User Group were on the next stand, again with some retro machines set up with games to be played, and high scores to be beaten. Old software – or new software for old computers – isn’t the only aspect of interest for those with a retro bent: as well as Retro Software, there is also Retro Hardware. Back in the day, Baildon Electronics developed a range of add-ons that were sold through P.R.E.S. amongst others, and Retro Hardware aims to reproduce many of these, with a particular focus on the Acorn Electron – and even designs new products for the computer. Returning to the subject of software, the next exhibitor was Flax Cottage, with John Dale’s huge collection of educational software for the BBC Micro range of computers. A selection of software was running on networked BBC computers, served up from (I believe) an Econet file server. The final exhibitor listed in the Retro Room was Daniel Jameson, focussing on networking with retro equipment. Daniel had an SJ Research MDFS running an econet network. The computers on the network were running a number of Acornsoft programming languages – COMAL, LISP, FORTH, PASCAL and BCPL – and Daniel had some small challenges for visitors who wished to try their hands at programming with them. 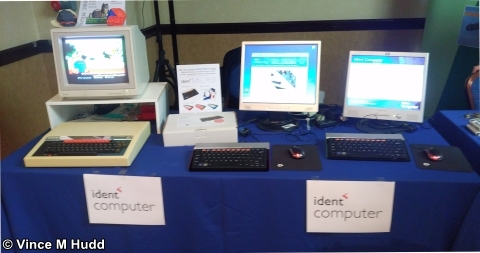 Moving into the RISC OS Room, and crossing over to change direction, the first exhibitor was Ident Computer, where Tom Williamson and his better half were selling the Micro One, a Raspberry Pi-based computer. The Micro One is supplied in kit form, and the finished product sports a form factor familiar to anyone who used computers in the first half of the 1980s. Rather than the modern form of the computer being in a separate case, with everything else connected to it, including the keyboard, the computer is actually housed with the keyboard. As well as producing this excellent piece of kit, Tom and Anna are keen supporters of the retro scene, and through Ident Computer repair and sell BBC Micros, and attend various events, such as Raspberry Jams, science fairs, retro shows, and can even take their kit along to school events to give students an introduction to programming. The next stand was home to the king of amusingly named products – Andy Marks, with RISCOSbits‘ range of, well, RISC OS bits. 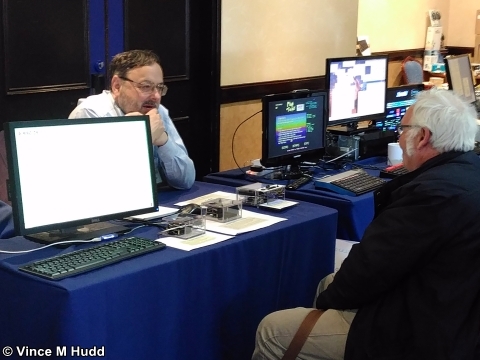 The goodies on sale at this year’s event included the PiPOD, RiscPOD, PiSSD! and the Absolute Zero – and a new product that was still to be named. 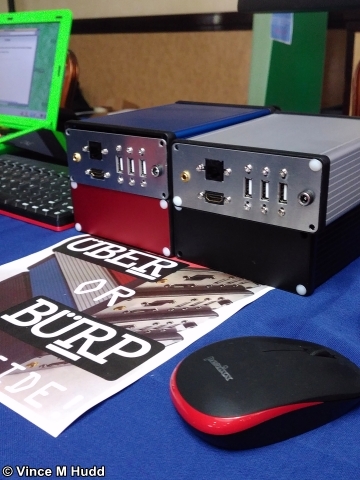 That new product took the form of a high quality extruded aluminium case that is able to house any one of a number of modern boards that can run RISC OS, such as the Raspberry Pi, Wandboard, or IGEPv5. The case is available in a range of four colours, and two sizes, with the various cables available separately (since the requirements for each of the boards that can fit in the case can vary). Andy had come up with two possible names for the case, and a poll was being held to decide which it should be – ÜBER or BÜRP. There was also an ‘Other’ category, for which people who selected it had to suggest an alternative (it wasn’t actually going to be called ‘Other’ if that category saw the most votes) – but the end result was that the RISC OS community made the right choice, and the new product’s official name is BÜRP. For Raspberry Pi owners with their tiny computer already housed in the official case, Andy was also selling a range of vinyl ‘skins’ that can be used to wrap the case and give the Pi a lick of RISC OS (or Acorn) flavoured colour. 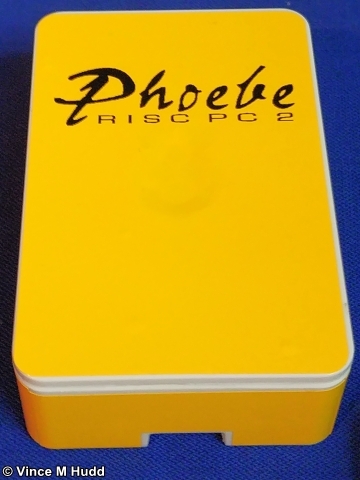 There were a number of different designs in the range – including a RiscPC-based skin, and a striking (ahem) yellow Phoebe-based one, and they were available at a very low price. 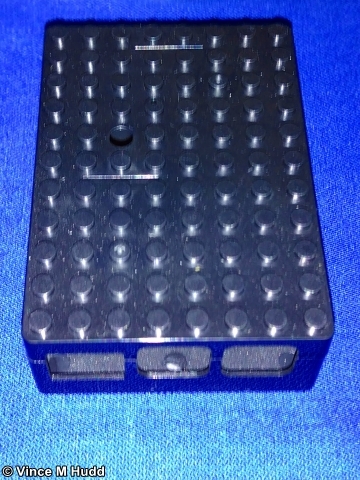 And somewhat less Acorn/RISC OS related, there was also a lego skin! 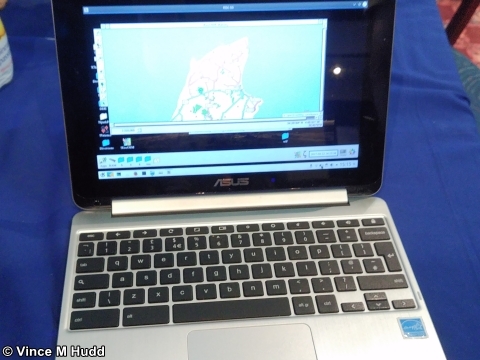 Somewhat more usefully – especially for owners of the Raspberry Pi-based laptop, whether that be purchased separately as the Pi-Top or from CJE Micro’s as the Pi-TopRO – Andy was also demonstrating Wispy, a neat little solution that provides RISC OS with the ability to connect to WiFi connections. 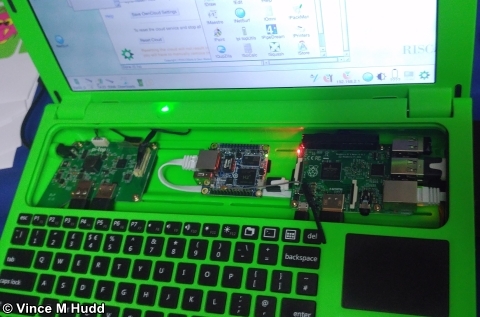 The hardware component of Wispy is a 512MB Orange Pi Zero, and RISC OS can connect to it to set up WiFi connections using NetSurf. In addition to that, other software that can be run on the Orange Pi can be accessed using RDP from RISC OS – therefore offering users access to a fully featured web browser, for example. Organizer, the – no THE – personal information manager for RISC OS was available on the North One Communications stand, where Cut-me-own-throat Dibbler Nigel Willmott was ably demonstrating version 2.26 and its capabilities, which include being able to password protect and encrypt data, so that it can be safely placed in cloud-based storage (such as pCloud, supported by Elesar’s CloudFS). Some people have asked me about this at shows, so for the benefit of them and anyone else who doesn’t get the joke: Organizer is supplied either as a download (or by email) for use on a normal RISC OS computer, or on a USB stick along with a copy of RPCEmu for use ‘on the go’ on any computer capable of running the emulator. In this latter form it is called Organizer on a Stick. In the late Terry Pratchett’s excellent Discworld series, there is a recurring character called Cut-me-own-throat Dibbler who sells rat-on-a-stick – so whenever I mention Nigel on RISCOSitory, I deliberately precede his name with that of the Discworld character, crossed out. Anyone who doesn’t get the joke/reference probably needs to read the Discworld books. They really are very funny, and highly recommended. Matthew and Hillary Phillips of Sine Nomine were on the next stand, with updates to a number of their products. Mathematical puzzle game Wrangler had gained two new puzzle types, bringing the total up to eight, while relational database Impact had seen its import tool greatly improved, making it much easier to import data into an existing database, or create a new database from raw data in CSV files. The improved importing facilities in Impact were based on similar facilities developed for RiscOSM, the mapping application that uses data derived from OpenStreetMap, which had itself been updated in a number of ways – including the ability to not have maps oriented on screen with North at the top. 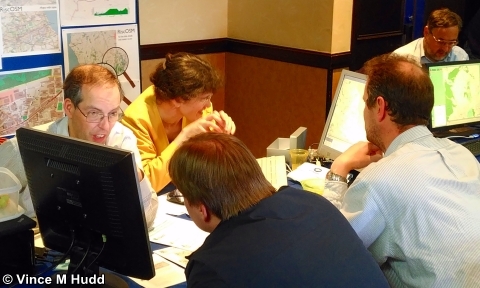 If you’re wondering if there’s a reason for being able to draw maps with North not at the top of the screen, the answer was on the next stand – where Chris Hall was demonstrating his GPS unit, based around a Raspberry Pi running RISC OS. Chris’ SatNav application runs on the Pi, reading the information from a GPS HAT device, and – in its lowest power form – displaying it on a PaPiRus display. (To save power further, the Pi is switched on periodically, runs SatNav to update the display, then switches off again). However, the Pi can also be connected to a ‘normal’ display, whereupon SatNav can pass suitable messages to RiscOSM, resulting in the displayed map being updated on the fly as the location changes. With most satellite navigation systems, it is customary for the ‘top’ of the map to be the direction in which the user is travelling, rather than North, because it’s easier to make sense of the map if it’s ‘facing’ the same way as the person trying to read it – hence the new feature in RiscOSM. 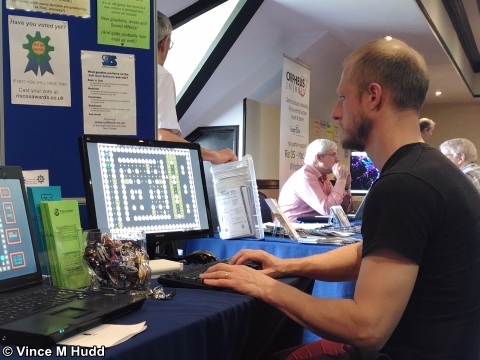 Next to Chris was the AMCOG stand, where Tony Bartram had his range of RISC OS computer games available, both individually and as part of a collection, along with a kit for developing games – a new product launched at the show. All of the games have been written in BBC BASIC and as well as the kit, there were two other new titles. The first of these, Cyborg, was on sale as a product in its own right while the second, Mutant Penguins, was available on the CD with the kit (and has since been released as a free game, available from !Store). As well as the games, Tony – who is also an amateur musician – has been working on a Wavebox-inspired synthesier module called RDSP (RISC OS Digital Signal Processor), which provides modern RISC OS systems a means to synthesise sounds, and to play back sound samples with various effects applied. And all of this can be easily achieved through BBC BASIC’s ENVELOPE and SOUND commands. Tony also gave one of the day’s theatre presentations, in which he covered RDSP in detail, and demonstrated several of the games. The little shop with a lot of stock had the next stand, where Chris Evans and Andrew Conroy had once again chosen not to bring the kitchen sink (I suspect it’s the one thing they don’t have in stock, or possibly just don’t stock to begin with) – but did somehow bring a small quantity of what might not be everything they sell, but it must certainly seem like it to visitors. Because, as ever, there was a huge range of goodies from the CJE Micro’s and 4D stockpiles available for punters to purchase. The company usually has a plethora of handy bits and pieces for every need – something for which I have been thankful in the past on more than one occasion, having discovered when setting up at shows that I am missing a cable here, or have forgotten to bring an SD card (or ran out of space on one) for the camera, and so on. Whenever that happens, off I pop immediately to the CJE Micro’s stand to obtain what I need. But in addition to a ready supply of smaller items, the stock they bring extends to larger items, such as monitors (something I’ve not forgotten to bring as yet – though I have come close!) – and, of course, computers; not only older machines, but also their own systems; the various machines in the RapidO range, and the Pi-TopRO. Chris Evans did his customary stint in the show theatre, where he talked about various specific items they had available – including a serial mouse, suitable as a replacement for Acorn’s quadrature mouse, the Pi-TopRO, a pressure sensitive touch pad, and more. 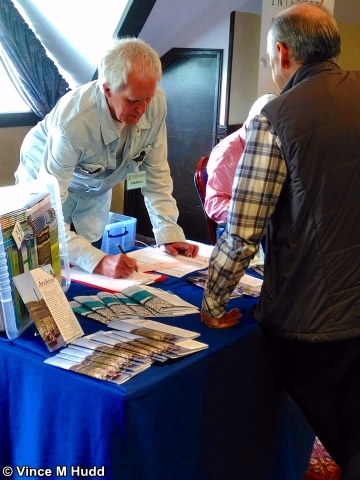 The next exhibitor was Steve Fryatt, who was demonstrating a range of software products – such as CashBook, PrintPDF, and more – and selling the most recent versions of his titles bundled together on a CD, with the proceeds going to charity. The company charged with acting as stewards of the operating system were next. 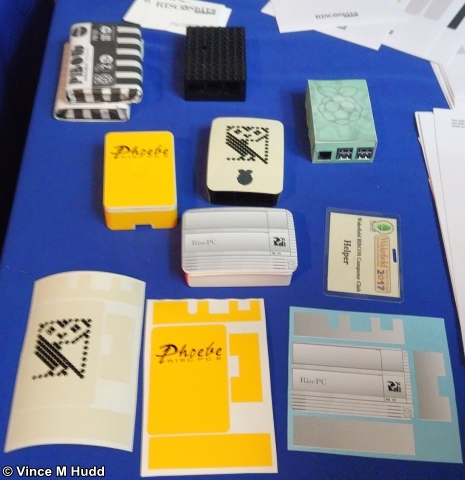 RISC OS Open Ltd had a range of goodies for people to buy; the latest development tools, memory sticks with RPCEmu installed ready for use on MacOS X, Linux, and Windows, ROMS for older computers, and books from their growing range. And as well as those books available to buy, visitors could also see the latest draft user guide – a fairly key book for new users, that hasn’t seen a proper update since the days of Acorn. RISC OS Pi, an SD card containing the RISC OS ROM image and a default set of software, suitable for booting a Pi into the operating system. Ideal for anyone who isn’t sure about creating their own SD cards, so that they can use RISC OS on the Raspberry Pi. Nut Pi, a collection of commercial software from a number of RISC OS developers, brought together and made available for a price that represents a great saving on buying the various items of software individually. 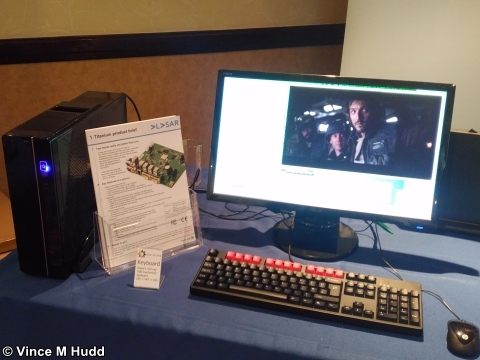 RISC OS Open teased the community prior to the show, suggesting there would be something “epic” announced – clarified the day before the show as “ePic”, which capitalisation hinted at either something graphical, or something Pi-related. It turned out to be the latter. ePic is the name used for a merging of those two Raspberry Pi products into one: RISC OS ePic is a 16GB SD card for the Pi that contains both the RISC OS ROM and disc image of the RISC OS Pi card, along with all of the software found on the Nut Pi card. Combining the two was a good idea, and something that should probably have been done before (hindsight is great, isn’t it?) – so ROOL are to be applauded for having done so at last. However, this also led to a common complaint I heard on the day. Because of the “ePic” tease, people were (rightly) expecting something significant to be announced – and combining the two cards into one was anything but significant in the sense people expected. There were quite a few annoyed punters at the show, and I can’t blame them one little bit for feeling that way about the announcement. It was very much something of an anticlimax. During the Q&A section of the talk (at just after the 22 minute point in the video) an audience member asked Steve about a “Linux port” of RISC OS that had been under discussion on the ROOL forum. 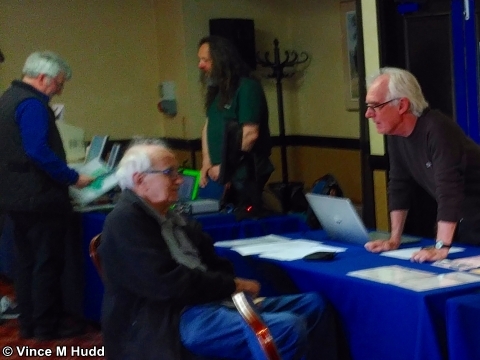 Despite that discussion going all the way back to February, until the Wakefield Show it was something that I was blissfully unaware of, but the person responsible – Timothy Baldwin – was at the show, and had brought along a Linux machine on which he had RISC OS running. The computer in question has an ARMv7 processor, and the RISC OS ROM image runs natively (not under emulation) as a Linux executable – like any other program that runs on Linux. Full technical details of this impressive piece of work, including instructions on how to get it up and running yourself, and a long discussion thereof, can be found on the forum link above. On-off-on-off-under-new-management PDF magazine Drag ‘n Drop was represented on the next stand by editor Christopher Dewhurst, who had brought along the latest issue. Volume eight issue three is the thirty first issue of the magazine and, according to my maths, the nineteenth issue published by Chris after taking over from Paul Stewart, the original editor and founder of the magazine. All 31 issues to date could be had on a USB memory stick, and Chris was also selling The Book of Draw Stuff, a CD-ROM containing 55 BBC Micro books, and his newest product, 20th Century Fonts, a CD filled with fonts, and a printed catalogue of its contents. The game benefits from new, higher resolution graphics, and more levels than the original forty – with the movement of the patrolling ghosts changed for level 41 and above, making them less predictable and the game more difficult. The latest issue of Archive Magazine – volume 24, issue 3 – was published the week before the show, and was available on the day in return for a subscription fee. 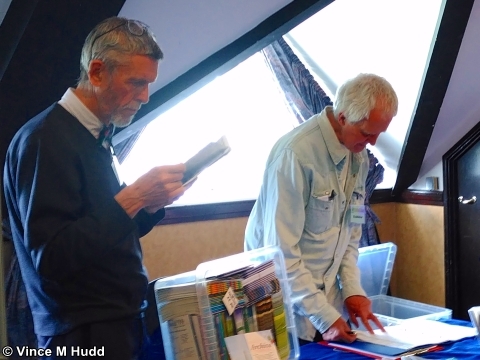 Both the founding and current editors – Paul Beverley and Jim Nagel respectively – were there on the day to handle those subscriptions, as well as taking orders for the volume 23 CD/DVD (containing the articles from every issue of the magazine up to and including that volume) which is currently in production. The penultimate stand was home to Richard Brown, customarily representing Orpheus Internet, but this time also new company RISC OS Developments. As Orpheus Internet, Richard represents the most RISC OS-friendly ISP there is. Formed over ten years ago by the late Paul Vigay, the company has seen internet change from largely dial-up connections to largely (and ever faster) broadband connections becoming ever greater, and also offers a range of hosting packages. The new company, RISC OS Developments, was formed in the period between the Southwest and Wakefield shows, and resulted from a conversation with a RISC OS user. 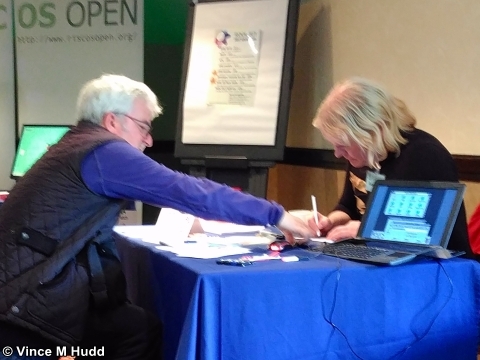 This led to Richard discussing the matter with R-Comp’s Andrew Rawnsley (who is also a RISC OS Developments director) and then approaching other exhibitors about the idea – and that in turn led to the formation of the company. 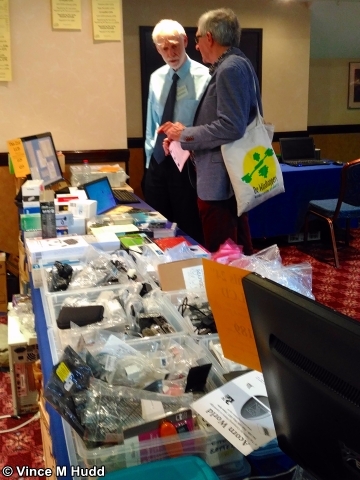 The final exhibitor this year was R-Comp, with their usual wide range of software and hardware. In terms of software, the company had new versions of Genealogy, Fireworkz, NetFetch, and more – all native RISC OS software – as well as the latest version of their ‘Graphical Linux’ for Titanium board. There was also the latest version of the R-Comp Bundle CD – a collection available to anyone who has purchased any of their computer systems, the CD contains a huge range of R-Comp’s software for a very low price. And speaking of their computers, there was of course a selection of these available – both native systems, such as the ARMSX ARMX6 and TiTanium machines, as well as systems running on alien hardware and using an emulator as a RISC OS solution, such as RISCubes and RISCBooks, including the newest addition to the range, the RISCBook Go! So that – in a slightly more detailed nutshell than I anticipated when I began writing this report – was Wakefield 2017. 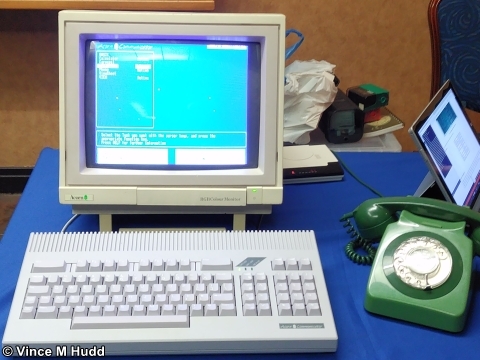 More (and better) photographs can be found on Stardot and on Ian Wolstenholme’s Beebmaster website (though unsurprisingly focussed on the Retro Room in both cases) as well as on the Icon Bar website along with a write up of the show (this time with more of the RISC OS Room). What do you get if you cross a two headed Titanium with 256 colours?